STOP PRESS - these proposals for the Regulation were passed unanimously at yesterdays meeting. Follow this link for the text of the proposals. This is expected to be a Rubber Stamping of the proposals because the MEPs are afraid of losing the consensus that they have achieved. Most of the specific changes we want will take place at Member State level, however thanks to the strong support from MEPs the new proposals do contain many new safeguards regardng the labelling of follow-on milks, safety of ingredients (all NEW ingredients will have to be reviewed) and other things. These should all strengthen EU controls in all countries and change the way that the EU interacts globally. We did not get the ban on promotion of foods follow-on formulas and foods for infants and young children that we wanted but the new legislation should be an important step in the right direction. "Toddler milks and special and/or supplementary foods for toddlers are not required for healthy children. "During the negotiations Parliament achieved that the list of substances which might be added to the food would be included into the basic act as an annex, and would be updated in the future by delegated acts. The three lists of substances existing today have been merged into a single list to preserve the status quo. Furthermore, the compromise accommodates Parliament’s request that the list specifies which categories of substances might be added to which category of food; and that not all substances may be added to all categories of food." Most health professionals agree that Optional Ingredients should be kept to an absolute minimum and ALL ingredients should be pre-authorised. We have been pushing for this for years and the new proposals go halfway to achieing this. "If an ingredient is unequivocally beneficial as demonstrated by independent review of scientific data it would be unethical to withhold it for commercial reasons. Rather it should be made a required ingredient of infant formula in order to reduce existing risks associated with artificial feeding. To do otherwise is not in the best interests of children, and fails to recognise the crucial distinction between these products and other foods." accompanied by a legislative proposal"
Baby Milk Action Comment: We are not aware of any health professionals who are not paid by or working with the baby food industry - who consider these products to be necessary and risk free. Most know that they are a marketing scam - but a hugely profitable one at tha. The frightening thing is to see how the baby food industry is riding on the back of the debates about hunger and micronutrient deficiency - exploiting parents fears that famly foods after 12 months are not adequate. We are really pleased that EFSA will be examining these milks. Lets hope they should a strong working group that is Conflict of Interest Free. Scope: Parliament clarifies that the Regulation, complementing Union law on food, establishes compositional and information requirements for certain categories of food, including food for special medical purposes, including formula intended for low birth-weight and pre-term infants, food for people intolerant to gluten, and foods intended for use in low calorie diets (LCD) and very low calorie diets (VLCD). VLCD products contain between 400 and 800 kcal per day. LCD products contain between 800 and 1200 kcal per day. ces that can be added to the categories of food referred to above for a specific nutritional purpose. The requirements laid down in this Regulation shall prevail over any other conflicting requirement of Union law applicable to food. Definitions: Parliament amended some definitions and added clarification on the meaning of ‘foods for special medical purposes.’ Parliament deleted the Commission’s proposal on empowering the latter to amend certain definitions through delegated acts. Placing on the market: Members state that food imported into the Union for the purpose of being placed on the market shall comply with the applicable provisions of Union food law. Food exported or re-exported from the Union for the purpose of being placed on the market in a third country shall comply with the applicable provisions of Union food law, save if specific circumstances in the importing country, linked, for example, to climate or topography, justify a different composition and a different market preparation. Innovation clause: Parliament adds a new clause whereby In order to enable food referred to in the Regulation and resulting from scientific and technological progress to be placed on the market rapidly, the Commission may, after consulting the Authority, adopt delegated acts authorising, for a two-year period, the placing on the market of food which does not comply with the rules on composition laid down by the Regulation and by the delegated acts adopted pursuant to the Regulation for food referred to in the text. Precautionary principle: a new clause states that where, following an assessment of available scientific information, there are reasonable grounds for concern for the possibility of adverse effects but scientific uncertainty persists, provisional risk management measures may be adopted that are necessary to ensure a high level of protection of the vulnerable groups of the population for whom the food referred to in the text is intended. Oversight: Parliament adds this clause stating that national competent authorities shall ensure that an adequate system of oversight is put in place to ensure that market operators comply with this Regulation and with the relevant health requirements. Food for normal consumption: a new clause states that in the labelling, presentation and advertising of food for normal consumption the following shall be prohibited: (a) the use of the expression ‘specialised nutrition’, either alone or in conjunction with other words, to designate such food; (b) all other markings or any presentation likely to give the impression that the food belongs to one of the categories referred to in the Regulation. General composition and information requirements: the composition of the food shall be such that it is appropriate to satisfy the nutritional needs of persons to whom it is intended, in accordance with generally accepted peer-reviewed and independently evaluated scientific data and medical opinion. The labelling, presentation and advertising of the food shall be accurate, clear and easy to understand for consumers and must not be misleading. It shall not attribute properties to such products for the prevention, treatment or cure of human disease, or imply such properties. Members tightened the Commission text, stating that the dissemination of any useful information or recommendations with reference to certain categories of food may be made exclusively to persons having qualifications in medicine, nutrition or pharmacy. Additional information disseminated by healthcare professionals to the final consumer shall only be of a scientific and factual nature and shall not contain advertising. Parliament adds that in order to ensure efficient official monitoring, food business operators shall notify the competent authority of each Member State in which they place food on the market, by forwarding it a model of the product's label. 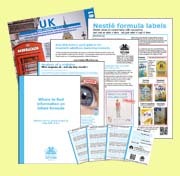 Infant formula: the labelling of infant formula and follow-on formula shall not include pictures of infants, nor shall it include other pictures or text which may idealise the use of the product. Graphic representations for easy identification of the product and for illustrating methods of preparation shall, however, be permitted. Directive 2006/141/EC shall be amended accordingly. Pesticides: the use of pesticides in agricultural products intended for the production of the food shall be restricted as far as possible, without prejudice to Directive 2006/125/EC and Directive 2006/141/EC. Specific provisions relating to the food that lay down limitations on the use of or that ban certain pesticides shall be updated regularly, with particular attention being paid to pesticides containing active substances, safeners or synergists classified under Regulation (EC) No 1272/2008 on classification, labelling and packaging of substances and mixtures1 as mutagen category 1A or 1B, carcinogen category 1A or 1B, toxic for reproduction category 1A or 1B, considered to have endocrine-disrupting properties that may cause adverse effects in humans, or pesticides approved as 'candidate for substitution' pursuant to Regulation (EC) No 1107/2009. Delegated acts: the Commission is empowered to adopt delegated acts with regard to specific composition and information requirements of certain foods. This list is expanded in the resolution. Food for people intolerant to gluten: in addition to other requirements in the text, the committee added that food intended for people intolerant to gluten consisting of or containing one or more ingredients made from wheat, rye, barley, oats or their crossbred varieties which have been especially processed to reduce gluten, shall contain a level of gluten not exceeding 100 mg/kg in the food as sold to the final consumer. There are further provisions on labelling for gluten. The statement ‘very low gluten content’ should be used only for products that contain less than 100 mg of gluten per kg, while foods with less than 20 mg of gluten per kg may be labelled ‘gluten free’. Food intended for people intolerant to gluten shall also comply with the following criteria: (i) they shall provide roughly the same amount of vitamins and mineral salts as the foodstuffs they are replacing; (ii) they shall be prepared with special care, in compliance with good manufacturing practice (GMP), to avoid gluten contamination; (iii) where the terms ‘very low gluten content’ or ‘gluten free’ are used, they shall appear in proximity to the name under which the product is marketed. Foods intended for use in low calorie diets and very low calorie diets: a new clause sets out labelling requirements. In addition, LCD and VLCD products must comply with the compositional requirements set out in a new Annex to the Regulation. Access for SMEs to the internal market: the Commission shall adopt appropriate guidelines through delegated acts and provide technical guidance to enable undertakings, in particular small and medium-sized enterprises, to comply with the requirements laid down in the Regulation and assist them in the preparation and presentation of the application for scientific assessment. It shall be empowered to adopt delegated acts in order to adopt those guidelines. Union list on vitamins: taking account of Directives 2006/141/EC and 2006/125/EC and Regulation (EC) No 953/2009, the Commission shall be empowered to adopt, no later than 2 years after the date of entry into force of the Regulation, delegated, in order to insert in Annex I a list of vitamins, minerals and other substances which may be added to each category of food. Parliament expanded the conditions which must be met in order for vitamins, minerals, amino acids and other substances may be added to food, including the condition that they must have, on the basis of generally accepted scientific evidence, a nutritional or physiological effect. For substances that are engineered nanomaterials, certain additional conditions will apply. Updating of the list of permitted substances: the applicant shall submit an application to the Commission which shall acknowledge receipt in writing within 14 days of its receipt. The Commission shall be empowered to adopt delegated acts in order to update Annex I. Confidentiality of information: any scientific data gathered from animal testing for the assessment of the safety of the substance will not be regarded as confidential. General transparency and confidentiality clause: Parliament adds that the Commission, the Authority and the Member States shall, in accordance with Regulation (EC) No 1049/2001,guarantee the broadest possible access to documents and, in particular, shall assist members of the public with, and inform them about, the procedures for submitting applications for access to documents. Food for people intolerant to lactose: at the latest 1 year after entry into force of the Regulation the Commission shall present a report, if appropriate accompanied by a legislative proposal, to clarify the status of labelling indications of 'lactose free' and 'very low lactose content' under general food law. Milks intended for young children: one year after the date of the entry into force of the Regulation, the Commission shall submit a report assessing the need for special provisions regarding the composition and labelling of milks intended for young children between one and three years. This report shall consider the nutritional needs, the pattern of consumption, the nutritional intake and the levels of exposure to contaminants and pesticides of these young children. The report shall also consider whether these milks have any nutritional benefits when compared to a normal diet for a child who is being weaned. In the light of the conclusions of that report, the Commission shall either decide that there is no need for special provisions regarding the composition and labelling of milks intended for young children, or submit any appropriate legislative proposal in accordance with the ordinary legislative procedure and on the basis of Article 114 of the TFEU. Prior to the preparation of the Commission report the milks intended for young children between one and three years shall continue to fall within the scope of the relevant Union legislation such as Regulation (EC) No 178/2002, Regulation EC No 1925/2006 and Regulation (EC) No1924/2006. Compositional requirements for LCD and VLCD products: the amended text sets out requirements for energy, protein, fat, dietary fibre and vitamins and minerals. It also sets out the amino acid requirement pattern.